Illustrator Stephen Conlin has carried out numerous commissions for the National Trust, English Heritage, Historic Environment Scotland and Historic Royal Palaces. He works by consulting scholars and using the available documentary evidence in order to enhance the understanding and appreciation of historic buildings. can show you how these important sites, landmarks and objects would have appeared when first built: in this way you have the chance to see how their designers and architects may originally have intended them to be. These drawings evoke the atmosphere of the past and are accompanied on this website by information about the buildings and objects. 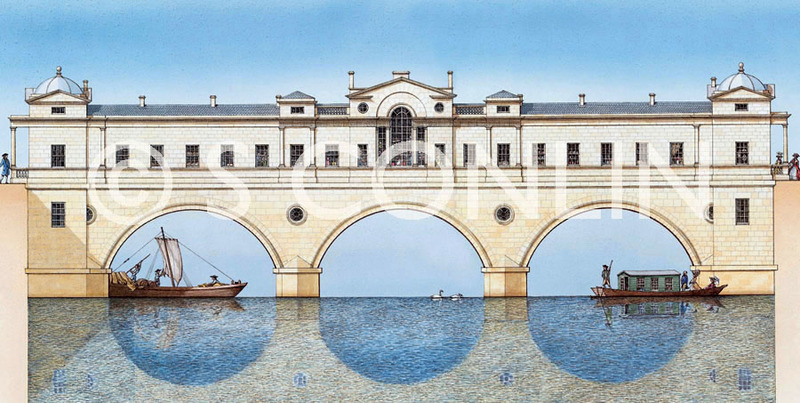 Above: a recreation of Pulteney Bridge in Bath,built between 1769 and 1774 by Robert Adam. Available as a souvenir card. 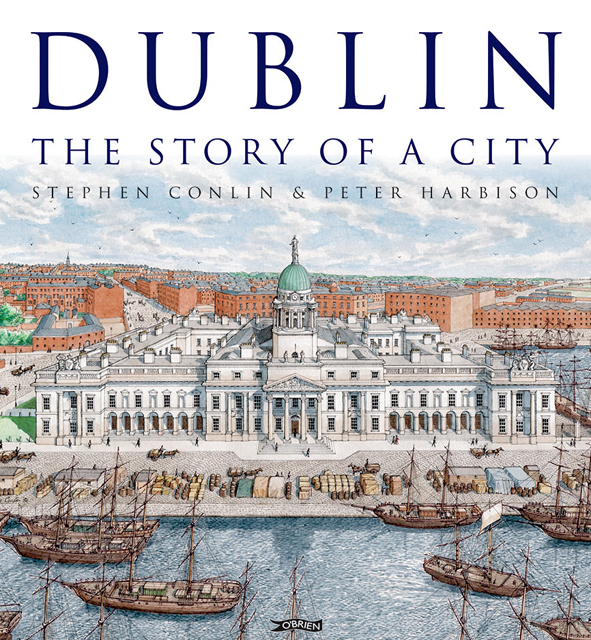 featuring important British and Irish architectural and historical sites, using detailed illustrations by Stephen Conlin. These cards are available to view and order on this website, click here. with main text by Peter Harbison, and detailed drawings and extended captions by Stephen Conlin. Dublin was founded as a Scandinavian settlement, linked by kinship to Norway; then it became a medieval town that formed part of a Norman sphere of influence across Western Europe. By the eighteenth century, it was a ‘polite’ city of the British Empire, before gaining independence and developing into a bustling, modern European capital. Hardback: 240 pages/ Size: 280x240 mm/ ISBN: 9781847178138. For sales website click here.